Not everything at PyOhio was perfect, of course. In particular, we were frustrated that we didn't get more participation in the Open Spaces. Some of the attendees pretty much took a spot in the auditorium, watched the scheduled talks, and went home. I think they were satisfied, but those attendees missed out on a lot. I wasn't too surprised, since even PyCon wrestles with how to encourage Open Space participation. Many PyOhio attendees were inexperienced conference-goers with absolutely no experience with Open Spaces. But I don't think unfamiliarity was the only barrier. Back in high school, I was one of the Good Kids. I was Born to be Mild. I went to class early, sat down, readied my notebooks, and waited for the teacher to start. I did not hang around in the hallway gossiping. I certainly did not cut class! I think most people who become programmers started out as Good Kids, and that's part of why this is hard. We can put a preachy message in the program guide singing the virtues of Open Spaces and the hallway track, of informal, collaborative learning - but they were Good Kids, and they're not buying it. When we say, "get into unplanned discussions, skip some scheduled talks in favor of Open Spaces", it sounds to them like "cut class and hang out." No wonder it's a tough sell! Closing their ears to that is exactly how they became educated enough to be at a programming conference in the first place. In high school, the things your peers could teach you would probably get you arrested, hospitalized, and/or pregnant. So we've got some ideas to get people over this psychological hump for PyOhio 2009. We're going to use panel discussions to ease people from listening into talking, try a schedule that forces people to get up and move around and bump into each other, and leave time slots where there are no scheduled talks. Honest, everybody, it's OK. One Good Kid to another. Wow. PyOhio went great. I have so much to say, I hardly know where to start. Expect multiple posts. The hope was to duplicate some of the learning and atmosphere of PyCon on the small scale. I really think we achieved it. The talks were excellent, attendee enthusiasm was high, and plenty of people stepped up to the tasks that needed doing. THANK YOU to everybody who was involved! Not everything was perfect, of course. I'll devote a full post to glitches and mistakes. But in general, I'm extremely happy. We could have sat around wondering whether this area could really support a good regional conference, but instead, we just went ahead and did the experiment, and the answer is clear: yes, it can and it did! 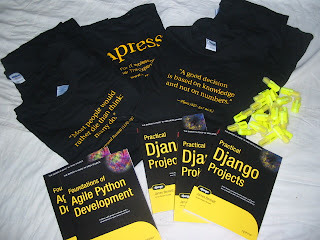 Check out some of the neat swag donation we got from WearPython and Apress! PyOhio is Saturday, July 26! Please register right away - it helps us schedule talks properly and guarantees you entry, food, and swag. What sort of Open Spaces do you want to take part in? Do you want to do a poster? How about a Lightning Talk? I just met with Amanda Laucher at the Blue Moose Cafe in Morgantown, WV. She's a serious geek-community addict like me - she's organizing the DevLink Bus. 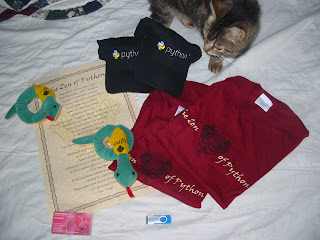 She gave me great advice for PyOhio and tipped me off to other upcoming events, and I gave her some ideas from PyCon. It was great! That's just really cool. Someday, when wireless access is ubiquitous, geekish nomads will no longer concentrate themselves in a handful of WiFi hotspots, and unforeseeable meetings like these will become more rare. That will be the downside of the future.